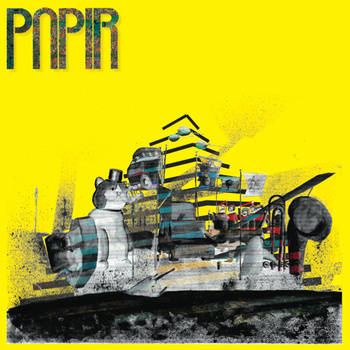 Papir is a young Danish band which plays all instrumental psychedelic krautrock. This is their debut LP and it features 4 tracks (2 on each side). Kurl te pow Ralise starts things off with some old school early 70s style electronic beat and then the rest of the band slowly comes in. There are a lot of nice psychedelic textures going on in this track and the guitar player plays some really cool stuff but he works the canvas as he likes, playing here and there as the track drifts into the netherworld. Lykk trep-R hi-lose (I am not at all sure what is up with these strange titles) finishes off side A. This track starts less spaced out with a steady drum rhythm, some keyboard lines, strummed guitar line, as it floats away and the killer bass line kicks in as the guitar sound goes into outer space. This is a very cool song. Side B starts with Une frensal n-erit. This one starts with a very spacey beginning and then the guitar riff kicks in but a lot of spacey cool sounds and things continue to bubble up and surface as the drummer keeps the drive of the song moving forward. It becomes pretty heady, psychedelic stuff as the track builds and Nikolas starts using his guitar pedals! Trippy and amazing track, a bit like the Spacious Mind a band these guys have probably never heard of. Rogter sot oe Koft ends the record. The track again starts with an old school drum machine like rhythm and now they have some piano played sparingly, which other sounds layer into the fold and the song develops and the heavy killer guitar riff kicks in. The drum sound is really low fi and special on this track and it gives it a cool sound. Wow. What a damn cool band. I have heard some of their new stuff and it is very promising as well. They are supposed to release a new record early in 2011 as they just recorded it recently with Jonas Munk of Causa Sui.